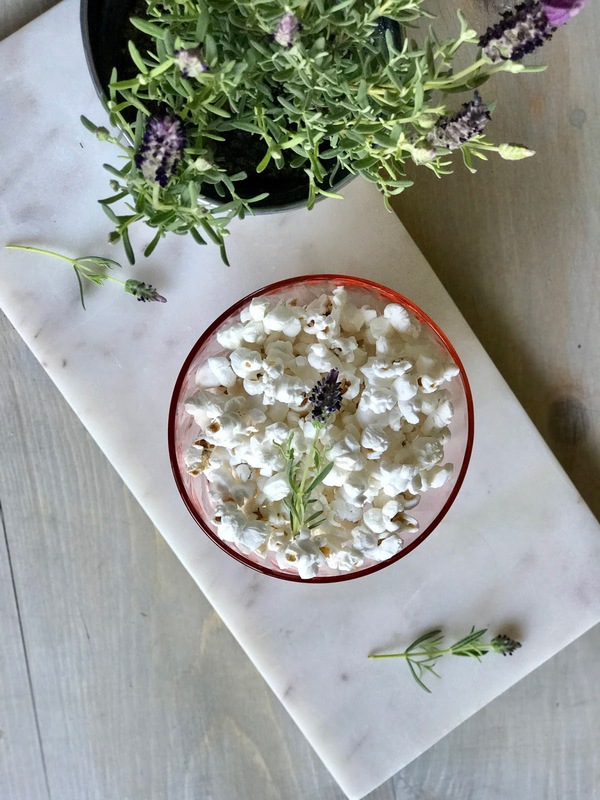 I was looking for a new super chic, super simple recipe to add to my party line up and this lavender infused popcorn is perfection. I mean all things lavender just seem so decadent! You would think that this would have an over powering floral flavor but it doesn't at all! The sweet from the vanilla and the salt mixed with a small floral note is amazing! Only one problem... this is so addicting! I am thinking of doing a fun movie night with my girls and putting little bowls of this all around! Ugh... a whole lavender theme would be so fun! I'm thinking a spa vibe! My mind is going crazy... def more to come on this girls night! In the meantime, do yourself a favor and go make this! 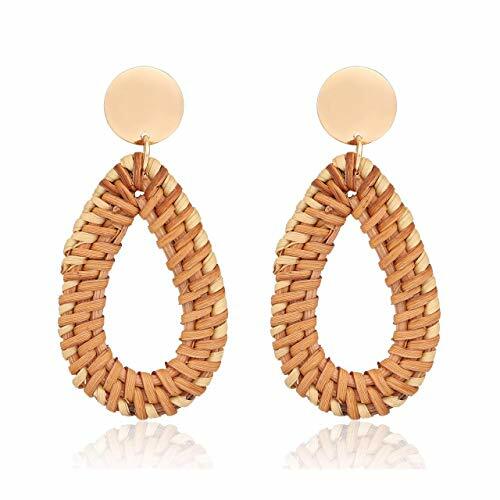 You will feel like a Goddess on a basic Wednesday night! Put coconut oil in a large pot. Heat on medium heat until melted. Add popcorn kernels. Put the lid on and let if pop until you are no longer hearing consistent popping. In a separate smaller pot melt butter, add lavender and vanilla bean paste. Let it simmer for a few minutes. Remove from heat and let it cool. Strain lavender buds out of butter. 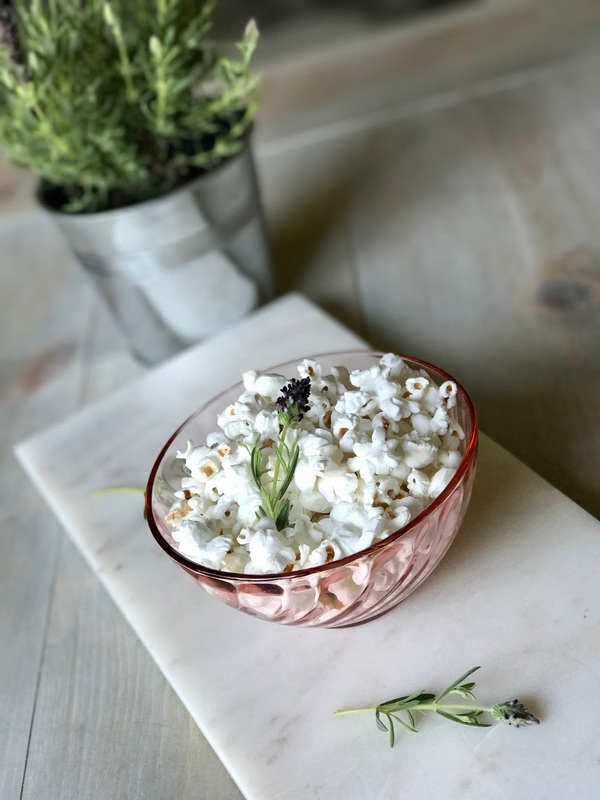 Drizzle the popcorn with the butter. Salt it. Top it with a few fresh lavender sprigs for extra credit! Oh my gosh! When the butter is melting with the lavender and vanilla bean... it smells like heaven! I need a candle in that scent, although I would be hungry all of the time if that were the case!